Pairing cigars with beer is more challenging than pairing them with more traditional cigar spirits. While nearly any good bourbon, scotch, or rum will go well with nearly any good cigar, beer’s flavor profile is more difficult to match up with stogies. With that in mind, I popped open a few bottles of Geary’s Pale Ale to see if it had the type of flavor that would pair well with beer. Geary’s is brewed in Portland, Maine, and is widely available in New England. Elsewhere Geary’s is tougher to find, so when I found it at a Total Wine here in Northern Virginia I grabbed a six-pack. A half inch of light, frothy head settled on top of the reddish brown ale after I poured a 12 oz. bottle into a pint glass. Geary’s doesn’t have as much intense hoppiness on the nose as many pale ales, but it seemed to have a pleasant floral aroma. When I got down to tasting, I found a crisp, heavily carbonated beer with an almost champagne-like quality. I also detected citrus to go along with a classic, if understated, pale ale hoppiness, as well as a hint of fruity sweetness as if a bit of hard cider had been mixed in. This is an excellent summer beer that will refresh on its own, or accompany a meal of lobster (such as the one that adorns the label). Pairing it with a cigar proved a little more challenging. The lightness means that it would be overpowered by a full-bodied cigar and almost any maduro. A mild Connecticut-wrapped cigar, however, seemed to pair quite well. I’d recommend the Perdomo 10th Anniversary Champagne, the Arganese Connecticut Ambassador, or the Romeo y Julieta Vintage line. 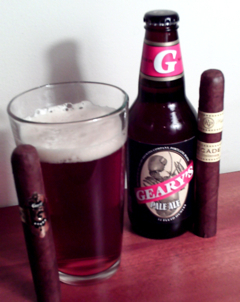 So, the next time you have the chance, I suggest you twist open a Geary’s (this rare micro brew that uses twist-off caps) and light up your favorite mild smoke that features a Connecticut wrapper. You’d be hard-pressed to find a better way to spend a warm summer afternoon.